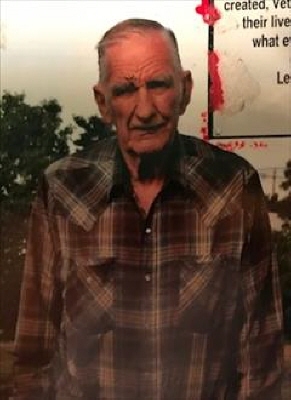 Jimmy Wesley Ammons, 83, longtime resident of Greer County past away in Atwood, Kansas on March 31, 2019. Jimmy was born December 18, 1935 in Mangum, Oklahoma to John Earl and Dixie (Graves) Ammons. He was raised and educated in Mangum, Oklahoma where he graduated from high school. During high school he worked at the Reed Cotton Gin, where he was involved in an accident losing several fingers. Jimmy would never allow this to stop or even slow him down. He was the owner of Ammons Garage and was known for his ability to fix anything. Jimmy and his entire family were custom cutters of wheat from Oklahoma all the way into Nebraska. He was also an accomplished welder, who was more like an artist than a welder. Jimmy also worked at Willis Monument as a mechanic. Jimmy is known for the creation and construction of the twelve-foot guitar statue in Granite that was built using various pieces of historical local items such as an antique combine. Jimmy was also known for the articles he wrote in the Mangum Newspaper. He enjoyed teaching his nieces and nephews to fish, ski, and boat. Jimmy was a proud member of the Lake Creek Baptist Church. Jimmy is survived by a Brother; Raymond Ammons, Nieces and nephews; Ronnie Ammons, Rebbeca Ammons, Brenda Ammons, Betty Eberheart, Harry Johnson and Sharon Harineck, and numerous cousins and great nieces and nephews. To send flowers or a remembrance gift to the family of Jimmy Wesley Ammons, please visit our Tribute Store. "Email Address" would like to share the life celebration of Jimmy Wesley Ammons. Click on the "link" to go to share a favorite memory or leave a condolence message for the family.